I hope you all had a good Valentine's Day weekend. Since I get to have President's Day off, it was a 3-day weekend for me, and I spent it pretty leisurely. Not too romantic, just relaxed at home and caught up with errands. 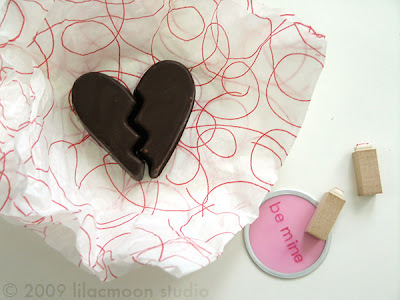 Here are some chocolates I made for citrusboy using heart-shaped molds. Thanks for you comment on my valentine!! My boyfriend loved it as well, which kind of surprised me because it's so obviously my style (which is maybe why he liked it!) But he put it up in his room for all to see! Ah ha! Someone noticed the Anthropologie tissue paper. ^^ Yes, I like to save pretty tissue papers for packaging. Thanks for stopping by!